With F-series Cushioned Pneumatic Vibrators vibration is generated by the movement of an internal floating piston rather than by impact between surfaces. Adjustable forces with weights (not supplied) can be mounted using the threaded bore at the end of the shaft. 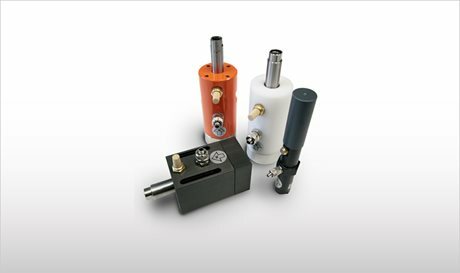 Cushioned Pneumatic Vibrators are a great alternative to magnetic vibrators for feeder applications. Recommended for coarse particle materials compacting in applications, the F-series is available in different sizes, materials shapes to satisfy a variety of requirements. Working pressure ranges between 2 6 bar (29 ~ 87 PSI) while operating temperature may reach 200 °C (392 °F).